High-school senior, Piper has been invisible in her school for years. Until one day, she gets herself a lot of attention for cheering for a band. Not that unusual? Well it is for Piper, because she’s deaf. And now her mouth has gotten her involved with the band as its manager. 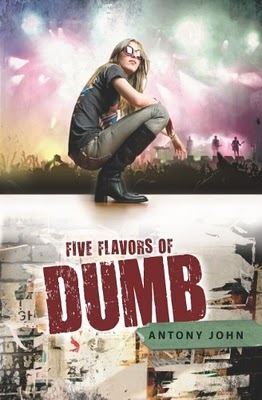 Now the girl who can’t hear the music has to figure out how to get the band ironically named Dumb paying gigs. And she has to do it in a month. Piper is tired of being invisible to her classmates and her family, so being a band manager comes at exactly the right time for her. It will take her getting to know the members of the band, understanding a lot more about herself, and learning to feel the music before she can discover her inner rock and roll. John has written a book with protagonist who has a disability but does not let it dictate her life. Piper is a great character who is filled with self-doubt but does not allow it to stop her from moving ahead. She is at times jealous, manipulative, pushy and self centered, and it all makes her that much more human and relatable. Throughout the book she is one amazing, powerful female character. Nicely, the book also has other great girl characters of different types. This book just feels real. John uses music and humor in the book to create a beat that moves the story forward. Small touches make sure readers know they are in Seattle. Piper’s entire family is vividly dysfunctional but equally believable and filled with love for one another, though they have problems showing it. The growth of the characters, including Piper’s parents, has a natural feeling. Highly recommended, this is a great teen book that is certainly not dumb. It just rocks. Appropriate for ages 14-17. I have this one on reserve at the public library. Can’t wait to tread it.